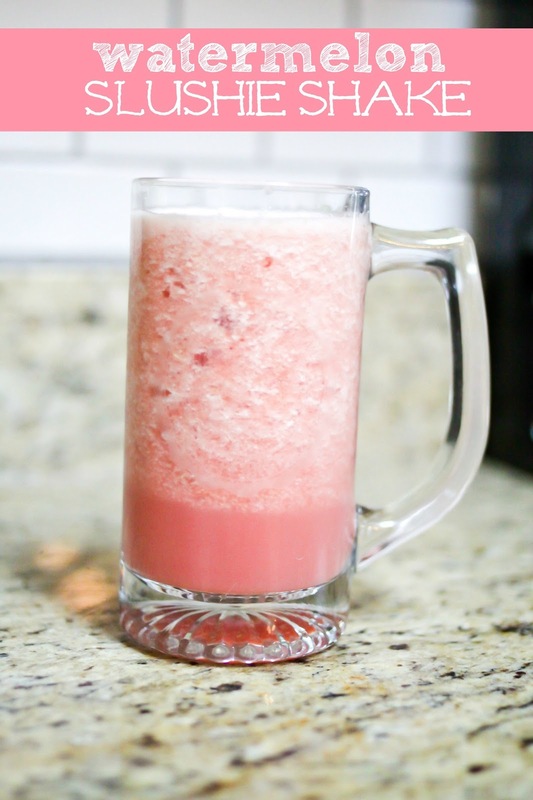 I Love You More Than Carrots: Make Your Own :: Watermelon Slushie Shakes. The smoothie craze hits in waves here in our house. Months will fly by where my husband and I are feverishly making smoothies in the morning before our day begins and then winter usually sets in and we retire the Magic Bullet until the warmer months reemerge. Our smoothies aren't fancy by any means, usually just some frozen fruit, greek yogurt, vanilla whey protein and juice (orange or a tropical fruit blend) to ease the blending process. We buy the frozen fruit in bulk from Costco and it will usually last us a few weeks before we have to replenish our stash. Even though the weather here has been less than desirable for the month of May, I started making smoothies a few weeks ago when the temps were in the high seventies and although most mornings it's still in the forties around here, I wake up looking forward to an ice cold shake for breakfast. And in this case, a pre-dinner snack. As the boys were ramping up winding down in the final hour before my husband was due home, I decided, as I was chopping up a fresh watermelon, that I needed a frosty little pick-me-up. Although I would have much rather brewed a pot of coffee for a late afternoon frappuccino, I knew this was the healthier option. Needless to say, it was absolutely delicious. Throw it all in your blender (or in my case, the Magic Bullet) and blend until desired thickness. I prefer for mine to be a bit more on the icy/slushie side so I do not blend until it is 100% smooth. After whipping this delicious watermelon slushie up, I took to the internet to find ways that I could make it thicker and creamier on the days when I might want something more shake-y and less slushie. I found this recipe that calls for frozen watermelon chunks, erasing the need for ice cubes, thereby rendering something that much closer resembles the milkshake. I already can't wait to try it! What are your frozen/fruit smoothie go-to recipes?